A feat that was previously held by India until World Cup in 2015, the Aussies managed to get past the highest team total set by any team in an ICC World Cup fixture. 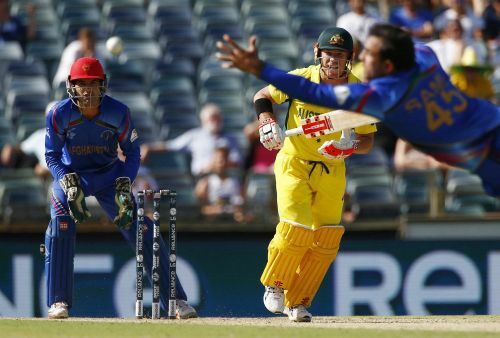 Being the host nation alongside New Zealand in 2015, Australia registered the highest team total against Afganistan at Perth in 2015. In a Pool A match, the hosts clobbered the inexperienced bowling attack to all parts of the ground. Doing the majority of the damage, David Warner led from the front and registered his then highest ODI score of 178 runs in just 133 balls to guide his team's total past the 400-run mark. It was an all-round batting effort as Glenn Maxwell delivered the knock-out punch to smash his way to a 39-ball 88. It was a thrashing by the hands of Aussies that Afghanistan were beaten by a margin of 275 runs - largest in the history of a World cup encounter.